The 23rd World Children’s Baseball Fair (WCBF) will be held from August 18 to 26, 2013 in Fukui, Japan. More than 200 boys and girls ages 10 to 11 from 20 countries including Cameroon, Brazil, Canada, Bhutan, China, Chinese Taipei, Japan, Korea, Nepal and Thailand Germany, Nepal, Russia and Australia will participate in baseball clinics and cultural exchanges. 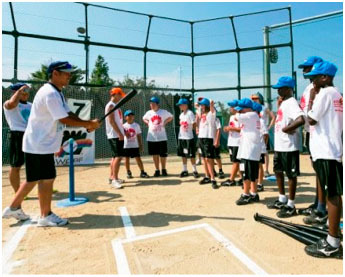 Established in August of 1992 thanks to the initiative of home run kings Sadaharu Oh and Hank Aaron the WCBF is held annually to expand baseball throughout the world and help children to learn the game. This event also is aimed to promote friendship among children and help creating a borderless world. The daily practice under the supervision of qualified and recognized IBAF Coaches will help improve their skill level and teaches them a healthy lifestyle, while at the same time gives a once in a lifetime experience. All participating children, including those who have never held a baseball, will experience the joy of baseball, and become able to play baseball by the end of the clinics. This year’s IBAF Coaching Staff will be led by head coach Angel Bonilla (USA, 23rd WCBF Appearance) and sub head coach Yoshihisa Ushikawa (JPN). Also on the staff are Edgar Perez (PUR), Robin Wallace (USA), Darwin Barker (CAN), Martijn Nijhoff (NED), Mathew Sundstrom (AUS), Daishin Nakamura (JPN) and Kazumasa Komeda (JPN). Additionally to the baseball clinics at the WCBF, the International Exchange Games Series was created with invited teams from Chinese Taipei, Korea and Japan, so the participating Children can enjoy and observe advanced play.